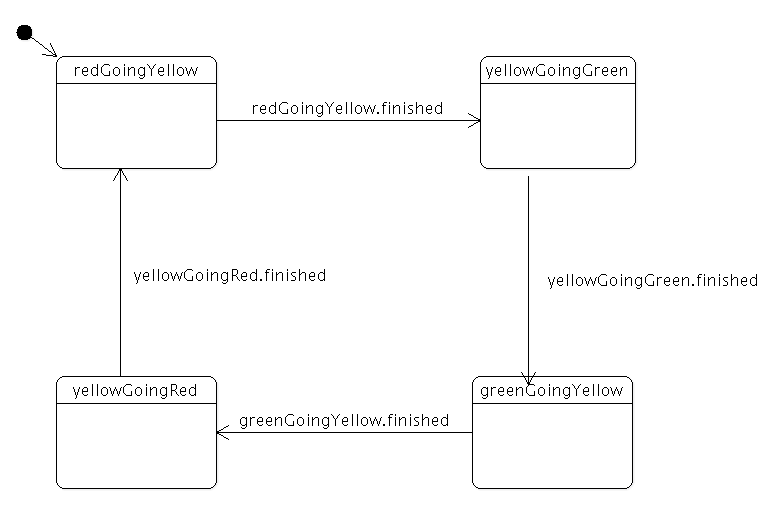 In this example we write a TrafficLightWidget class. The traffic light has three lights: Red, yellow and green. The traffic light transitions from one light to another (red to yellow to green to yellow to red again) at certain intervals. The LightWidget class represents a single light of the traffic light. It provides an on property and two slots, turnOn() and turnOff(), to turn the light on and off, respectively. The widget paints itself in the color that's passed to the constructor. The TrafficLightWidget class represents the visual part of the traffic light; it's a widget that contains three lights arranged vertically, and provides accessor functions for these. The main() function constructs a TrafficLight and shows it.